Nine Hospitalized After Car Wash Worker Collides With School Bus | Schuler, Halvorson, Weisser, Zoeller & Overbeck P.A. 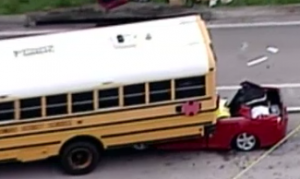 Nine people were injured when a car wash employee lost control of a fresh-scrubbed vehicle and slammed it into a school bus in Martin County, FHP authorities said. The accident happened in Jensen Beach near the intersection of Port Salerno and Hobe Sound Springs in Martin County. A vehicle had just gone through the Port Salerno Car Wash and Detail Center and was being moved by an employee, an unlicensed driver, who suddenly lost control and collided with the school bus, police said. The car then slammed into a pole before coming to a stop. A third vehicle, driven by a woman who had just dropped her child off at the school, also crashed at the location following the collision, FHP said. Paramedics took nine patients to local hospitals, a Florida Highway Patrol spokesman said. The bus driver and eight children in the school bus were taken to a nearby hospital by paramedics. The the car wash employee was hospitalized for neck and back pain, police said. The other driver refused medical attention at the scene. FHP said, the major cause of the crash is under investigation.